For many years now, the Office for National Statistics has been beavering away trying to develop measures of output and productivity in our public services. It hasn't been at all straightforward, as we can see by glancing at the dense array of statistical formulae they have been forced to deploy. Because we've shovelled vast amounts of money into these services over the last decade, and they now consume well over 20% of our national income. We need to understand just what we're getting in return. We need to know if we're getting value for money. And why's that so hard to do? Because the output of public services is not subject to valuation in the marketplace. We know precisely what cars and window cleaning services are worth, because the marketplace tells us. But with public services provided free at the point of use, we have literally no idea what they're worth. All we know is that they cost hundreds of billions every year, and since 1997 the bill has more than doubled. As we can see, they reckon that from 1997 to 2007, the combined output of our public services went up by 33.6%. Unfortunately, the inputs - after stripping out inflation - increased by 38%. So according to the ONS, productivity fell by just over 3%. Now let's just be quite sure we all understand what that means. It means that compared to 1997, our public services are now delivering worse value for money - we get less for every pound we put in. Ah well, you say, a fall of 3%... that's not too bad... at least the bulk of the extra money has fed though into more output... at least we are getting 33.6% more healthcare, education, law enforcement etc etc. Could be a lot worse, so stop whining. 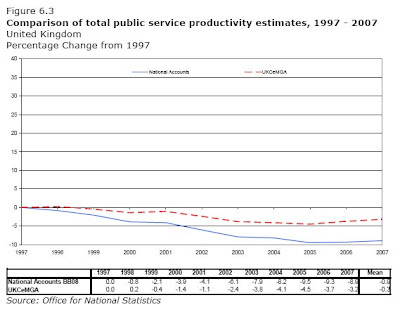 Just compare this public service productivity performance with that delivered by the market sector of the economy. 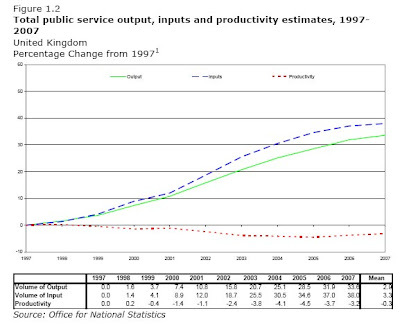 According to the ONS, over that same period, 1997-2007, productivity in the market sector increased by 2.2% pa. Which meant that by the end of the period we were getting nearly a quarter more output from the same input. So why can't our public services manage that? Surely they should be able to achieve at least some productivity gains. Surely they shouldn't be giving us worse value for money as each year passes. How hard can it be? And in truth, the picture is almost certainly even worse than the ONS figures suggest. That's because the ONS has incorporated into its output measures a series of highly contentious "quality" adjustments which they claim have the effect of increasing measured output year-on-year. For example, its measure of education output basically comprises the number of pupils passing through our state schools and colleges. But the ONS now adjusts that straightforward measure for supposed improvements in quality, and they do that by factoring in the year-on-year rise GCSE grades. GCSE grades as in prizes-for-all-dumbed-down-through-the-floor-abandoned-by-the-leading-private-schools GCSE grades? Why would anyone believe education quality has improved just because our kids have even more of them? Similarly, the ouput of healthcare services has been adjusted for supposed improved quality using - among other indicators - the reduction in recorded waiting times. Even though we know that waiting times are routinely massaged and gamed by NHS managers (see previous posts). So the ONS results almost certainly overstate the output growth of our public services and understate the extent to which productivity has fallen. As we can see, on this measure, productivity is down by 9% over the period, a fall of around 1%pa. Or to put it the other way round, even after allowing for inflation, every pound we put into public services today buys 9% less than it did a decade ago. Ten years of massive spending has left us with the fiscal headache to end all fiscal headaches. And despite interminable promises about public service reform, value for money has gone out the window. How long are taxpayers supposed to put up with this? The trouble is, while we can all see the shape of the real public sector reform we need, our politicians have yet to show anything like the political will necessary to push it through.